.... or does it seem like all of the loudest, most obnoxious drivers on the road are the same ones sporting cars plastered in WWJD bumper stickers, chrome fish emblems, "choose life" license plate holders and church logo window decals?? Or are those just assholes driving stolen cars that once belonged to church-going/heaven-bound folks? Maybe police officers should start targeting all the crazies posed as Jesus lovers, pull 'em over and haul their butts to jail. I say do it and ask questions later. I really don't think Jesus would stick the finger at a 80-year-old woman driving slow on a Sunday. 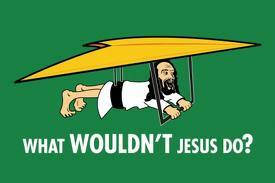 Nor do I think Jesus would lean on his horn at someone for not passing through a yellow light. I think the question we should all ask ourselves here is: What Would Jesus Do for a Klondike Bar? Steal a car? Possibly.